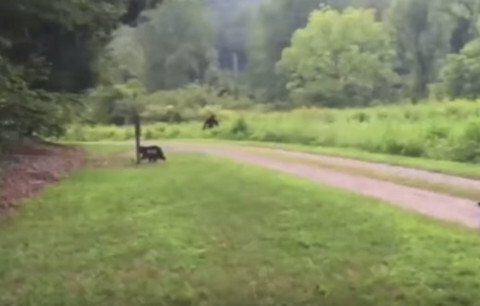 Was Bigfoot Caught on Camera in North Carolina? A man vacationing in North Carolina caught what appears to be a bigfoot on camera, but like all alleged bigfoot video, the footage is grainy, shaky and nobody tries to track the thing down. Eric Walters was walking his dog outside a cabin in Henderson County when he spotted the sasquatch looking creature walking upright in the brush across the road. With shaky hands, Walters videos the beast with his cellphone as his dog scares it away. As the camera pans away it focuses on a sign for the cabin advertising the rental company Carolina Mornings. A humorous response by the company’s chief marketing officer have some speculating the video could just be a marketing ploy. “I’m flattered that even Bigfoot knows that Carolina Mornings is the best vacation rental company in Western North Carolina,” Gay Weber told the Citizen-Times. Walters, who shot the video, has suspicions too. “Either there’s a Sasquatch out there or someone is trying to play a practical joke,” he told the paper.